The ZGPAX S99 is a Smartwatch and a Smartphone. It comes with a SIM slot and hardware that is able to run Android 5.1 lollipop. More specifically is a Mediatek MTK6580 with four cores and 1.3 GHz processor. A Mali-400 MP graphics chip brings as well as 512 MB of RAM and 8 GB storage space. However, you can not extend the Flash memory. 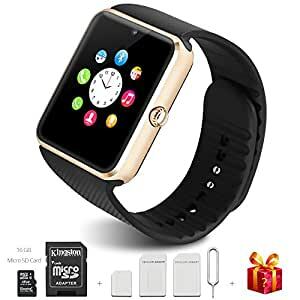 As a result the Smartwatch with a SIM card at the same time becomes the Smartphone you can communicate a variety of wireless technologies. Mobile phone is supported, as well as Bluetooth and Wi-FI. UMTS is available for the locations. The screen is 1.33 inches in diameter. 360 × 360 pixels are displayed on it. There is also a camera which can record videos with 2.0 MP resolves. The manufacturer will however be borne in mind that in the supplied firmware the camera does not work properly, an update will fix this. The battery has a capacity of 450 mAh. The ZGPAX S99 is currently cheap. Costs for the online mail order Gearbest they only EUR 117.